Count on an experienced company that has over 60 years' combined knowledge of health care focused design, tight integration with Meditech and the resources and skills to deliver award-winning services to your hospital. 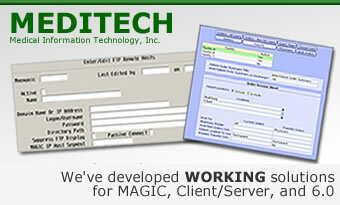 We've designed systems that are fully compatible with Magic, Client/Server, and 6.0. Let us help you demystify Meditech! We've been designing software for pediatric institutions for over a decade.